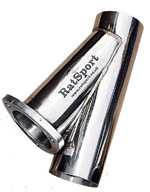 Exhaust cut outs enable the possibility of 2 exhaust systems in one car. Restricted (and quiet) for the street, freeflow (and noisy) for the racetrack. 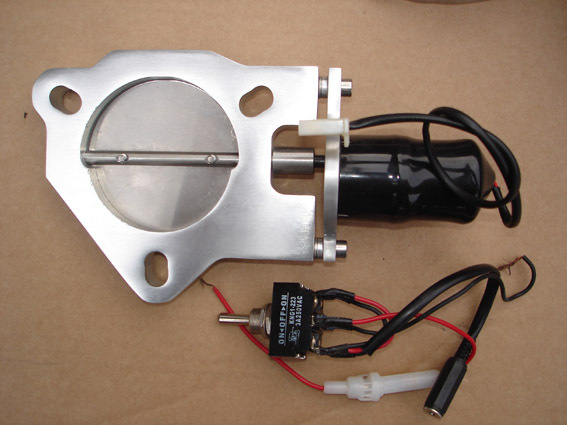 By means of a butterfly valve installed in the system you can direct the exhaust flow from the cockpit either through the standard exhaust or a more powerful and less restrictive system (or totally unrestricted) by the pull of a cable or press of a switch. This feature is a factory option on the current Maserati & Aston – now available here. As the powered version opens and closes in under 3 seconds it can also cause some smiles/frowns at the traffic light grand prix….especially if you route the exhaust to alternate final exit pipes. Cable controlled butterfly valve, 5' (1525mm) dashboard cable supplied. 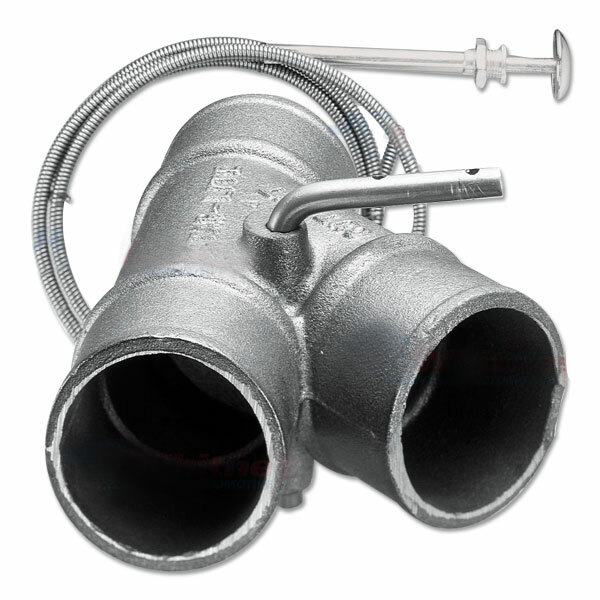 Fittings: 304 stainless, 3" OD, 45 degree 6.5" long post-valve extension pipe. Stainless flange. Mikalor exhaust clamp. What is the warranty: This product is intended for race use only and carries NO WARRANTY direct or implied. Does it come with instructions? 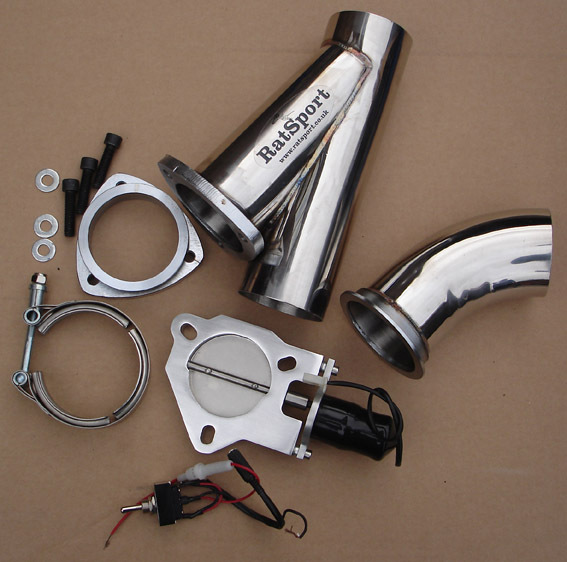 As with all race parts this kit DOES NOT COME WITH INSTRUCTIONS as fitting depends on your specific application. It should however be able to be fitted in a few hours by a competent mechanic. The electric supply requires only 2 connections earth and power. I have a V8. Do I need 2? If your exhaust is 2 separate systems (connected only by a balance bar) then yes you probably will. You could run with just 1 side open but this will tend to unbalance the engine (especially if you have a performance scavenging type manifold fitted) as well as making the car sound like an out of tune 4 cylinder. Does the valve need to be fully open or fully closed? No you run with it as partially open as you want, you control the degree of power & volume. I plan to fit the motor underneath the car so it is going to be pretty exposed, that OK? Yes its dirt & water sealed. Can you supply in a different size than 3"? No sorry. We built it as 3" as this it is rare to come across a vehicle exhaust larger than 3" so gas flow on the largest systems will not be diminished. If you need a reducer sleeve then they are readily available, including from ourselves. How smooth is the flow in the Y piece. Ive seen some "performance exhausts" which are rough inside and disturb smooth gas flow. So have I. This is very smooth. All internal welds are filed flat and each unit is hand finished internally. Im a trader. Can you do a trade discount? Yes we can discount any of our products only if you take 10 or more of each product.